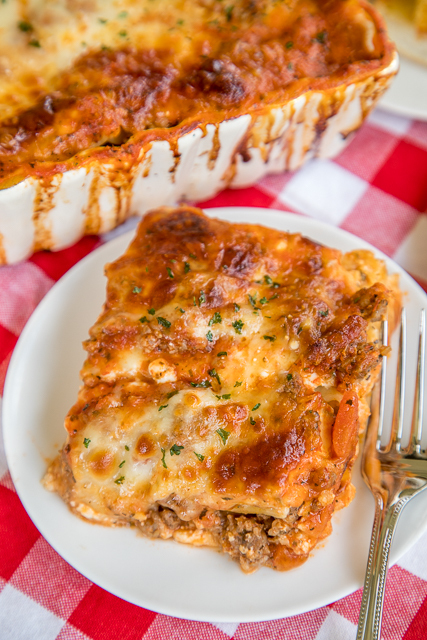 Overnight No-Boil Lasagna - seriously THE BEST lasagna we've ever eaten!!! SO easy to make and you don't have to boil your noodles! The noodles "cook" overnight and are perfect. Lasagna noodles, cottage cheese, italian sausage, spaghetti sauce, water, mozzarella, garlic and parmesan. Serve with some garlic bread and a salad. Can freeze leftovers for later. 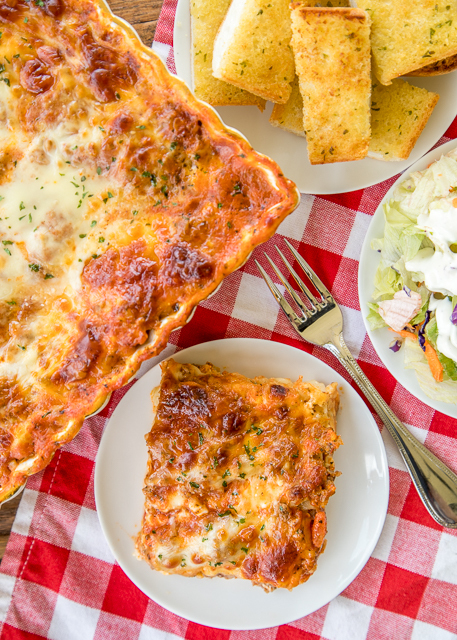 We LOVE this lasagna casserole recipe!!! Lasagna is a Christmas tradition in our house. It goes back to when I was a kid and HATED turkey and dressing. My Mom would make her lasagna for Christmas Eve, and I would leftover lasagna for Christmas dinner. Now I will eat some turkey and dressing for Christmas dinner, but we still make lasagna for Christmas Eve. I found a recipe for Overnight No-Boil Lasagna in one of my cookbooks. I thought it sounded like a great idea! I LOVE make ahead meals - especially at the holidays. I was skeptical about the noodles in this Overnight No-Boil Lasagna. I used regular lasagna noodles, not the no-boil kind. I was worried that they wouldn't expand, but they did! It was magic!!! I took one big shortcut to my Mom's lasagna recipe. I used a jar of spaghetti sauce instead of making her homemade sauce. I used a jar of Trader Joe's Roasted Garlic Marinara (it has a green label). The homemade sauce for my Mom's lasagna is AMAZING! I just didn't want to spend an afternoon tending to the sauce, so I used a jar of sauce this time. The key to getting the noodles perfect is the extra water added to the sauce. The noodles absorb the water overnight and they turn out exactly perfect. I LOVED not having to boil the noodles. It takes SO long for the water to boil. Plus it adds another pot to wash (for Chicken Legs to wash, that is). It was nice to just put them in the casserole uncooked. 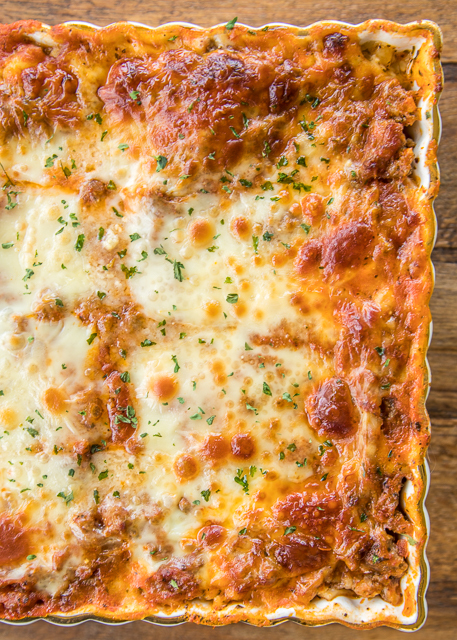 This Overnight No-Boil Lasagna was a huge hit in our house! I ate WAY too much of this!! I can not wait to make this again for Christmas. We served this with some garlic bread and a simple salad. SUPER easy!!! I froze the leftovers for a quick meal later. I cut the leftover lasagna into individual servings then wrapped them in freezer wrap and popped them in the freezer. It tastes just a delicious reheated! I hope you enjoy this as much as we did!! Brown sausage in a skillet over medium heat; drain. Stir in sauce and water. Simmer over low heat for 5 minutes. Remove from heat and set aside. In a bowl, combine cottage cheese, egg and parsley. Set aside. Lightly spray a 9x13-inch pan with cooking spray. Spread 1-1/2 cups meat sauce in bottom of pan. Top with 6 lasagna noodles, lengthwise and overlapping to cover. Top noodles with half of the cottage cheese, top with third of mozzarella cheese. Spoon 1-1/2 cups sauce over cheese; sprinkle with 1/4 cup parmesan. 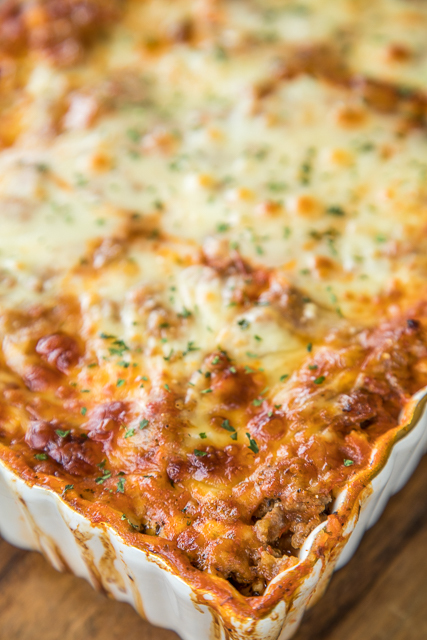 Repeat layering; starting with 6 lasagna noodles and ending with 1-1/2 cups sauce and parmesan cheese. Spread with remaining sauce; top with remaining mozzarella cheese. Cover with foil and refrigerate overnight. Preheat oven to 350ºF. Bake lasagna covered for 25 minutes. Remove foil and bake uncovered an additional 30 minutes, until bubbly. Let stand 15 minutes before serving. This looks really good! I'll let you know how it turned out! Stephanie do you think this would work with ricotta instead of cottage cheese? It would be just fine - enjoy! Do you think this would work with Gluten free noodles? I don't think this would work with gluten-free noodles. I don't think gluten-free noodles stand up as well in casseroles like this - especially soaking them overnight. Could you use ground beef or turkey instead of sausage? Absolutely! You may want to add a teaspoon of Italian seasoning to the meat mixture. Enjoy! How long do you think it could stay in the frig before baking? 24 hours? Longer? I usually leave it in about 24 hours - a little less. I think it would be fine for up to 48 hours. I made this the night before last with the substitution of ricotta for the cottage cheese which I thought would be too watery with the addition of the 1 cup of water. I also used fresh parsley. I think it could use more flavor even though I was using flavored pasta sauce. I will follow the suggestion of adding some Italian seasoning. After baking there was about 1/3 of a cup of liquid pooled under the mixture. If I make it again, I will cut the water at least in half. Everyone who has tasted it though, enjoyed it. Yes - the swap with ricotta and the consistency of your sauce will make a difference. I usually drain ricotta for a few hours before using to get out the excess water. Glad you enjoyed it! 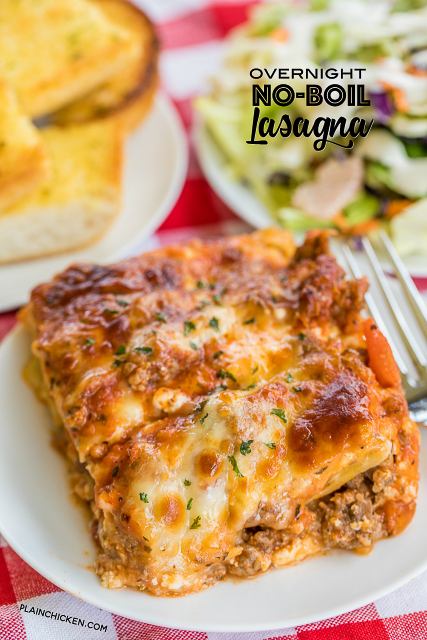 If I use no boil lasagna noodles, do you think I can bake right away instead of refrigerate overnight? and also cut out the water since it won't be needed for noodles? I don’t know. I’ve only made this recipe as written. 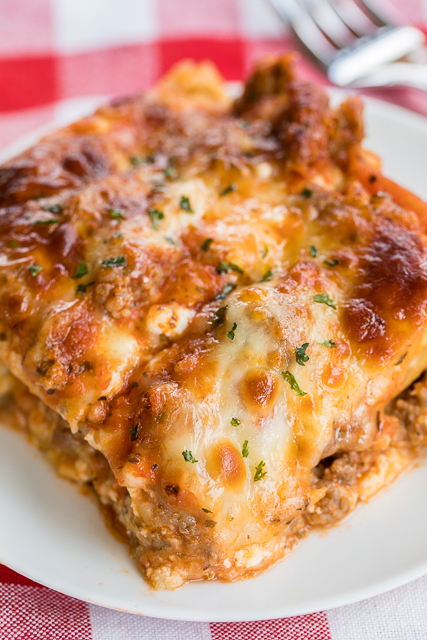 Does the recipe say to use no-boil or regular lasagna noodles. I think turkey sausage would be fine. If you use ground turkey, maybe add a little Italian seasoning to it.